Hans Eworth (or Ewouts; c. 1520–1574) was a Flemish painter active in England in the mid-16th century. 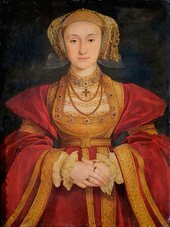 Along with other exiled Flemings, he made a career in Tudor London, painting allegorical images as well as portraits of the gentry and nobility. About 40 paintings are now attributed to Eworth, among them portraits of Mary I and Elizabeth I. Eworth also executed decorative commissions for Elizabeth's Office of the Revels in the early 1570s.